National Poetry Month 2012 is nearly upon us, with less than two months to go. I’ve got a few great bloggers willing to talk about poetry and to host reviews and guest posts in April, but I’ve still got some open spots on the schedule. Won’t you help me fill them in? I’ve got a few guest posts coming in from poets that need blog tour hosts for them. Just drop me an email if you want one and what day you want to host. Finally, anyone who would love to share the love of poetry through some giveaways in April, please sign up to donate books, poetry workshop classes, poetry journals, literary magazines, and any other poetry-related items. Send me an email to savvyverseandwit AT gmail with your donations and if you prefer I run the giveaway or you’d like to run it yourself. OK, that’s it. I hope everyone can help out. See you for the big tour in April. 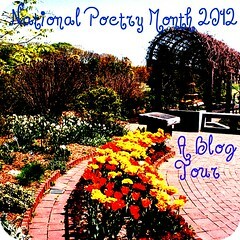 National Poetry Month 2012 is in April and I’m looking for guest posts from poetry readers and tour hosts for these guest posts. I want to fill out all of April early and be able to direct readers across the blogosphere for some great poetry discussion and celebration. Not only will you be part of a tour involving poetry collections, poet interviews, guest posts from poetry readers, and maybe even just some great poems and discussion, you also get my new snazzy button — and I can’t believe I made it myself from a photo my hubby took at the National Arboretum. OK, that’s a lame reason to join the blog tour. I’m hoping to put together some great giveaways for everyone who participates either as a commenter or as a blog tour host/guest blogger. I hope that even if you don’t want to participate you’ll spread the word. I want to fill up every day in April. Dates will be a first come, first serve basis, and I’ll be posting the participating blogs on the schedule below as I hear from people. Won’t you join me in celebrating poetry? Sunday, April 22 — Nicole Luongo from Bare Your Naked Truth at Peeking Between the Pages. Saturday, April 28 — David from Wordcoaster who will showcase bird poetry.